New Plymouth Boys’ High School has a variety of football teams designed to meet the needs of your son. From the 1st XI, which competes in national competitions, to social sides, our mission is to ensure that your son excels whilst enjoying his football experience at NPBHS. In 2015 the NPBHS 1st XI was crowned Super 8 champions by winning back the prestigious trophy after 15 years. 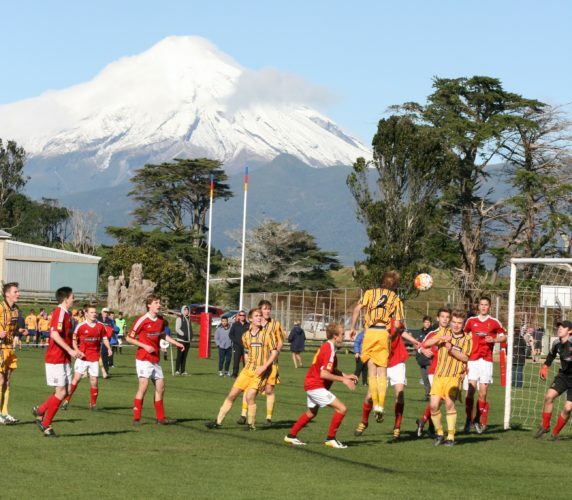 It is contested between eight boys’ high schools from around the Central North Island. The pinnacle of achievement for any NPBHS footballer is to be part of a team that finishes within the top ten placings at the premier national secondary schools competition. In 2015, the 1st XI achieved this for the first time in eight years by placing tenth. High performance teams will get exposure outside the Taranaki region via traditional college fixtures against Auckland Grammar School, Wellington College, St Pats Silverstream, Palmerston North Boys’ High School, and Hamilton Boys’ High School. All teams within NPBHS compete in Central Football Federation competitions played on Saturdays. Training: The teams practise after school twice-weekly at Webster Field or Te Mete Park. Uniform and Equipment: Students are required to provide black shirt, shorts and socks (available at clothing shop). High performance teams have playing kit provided. Students are also responsible for providing their own boots and shin protection. Cost: Basic sub is $55.00. High performance teams will incur extra costs.